This was my first big, loud rock concert. I was so young (13) and had only seen The Beach Boys & B-52s before this. I love those bands, but they couldn't prepare me for this. I remember racing with my parents to our seats as "Firebird Suite" became "Yours is No Disgrace." So dramatic! The crowd was on its feet and loosing it and the first notes hadn't been played yet. I really remember a veteran in a wheelchair with his arms raised high, yelling "wooo," eyes locked forward, rapt with anticipation. I Had never heard such a huge sound before and never seen a crowd so wild. It was so thrilling it scared the hell out of me. My father was furious when I left to use the restroom a couple of songs in, but my nerves had been rattled. I was much more calm when I returned and enjoyed the rest of the show. I've been thinking of it now that Chris Squire has passed. Every instrumentalist had a counterpart on that stage except him. I remember his bass solo so vividly (bass solo! that was a new one for me!) He kept coming back to this one low note that, for whatever reason, rattled the roof above the bleachers. Saw a clip of a similar solo from this tour on youtube recently, and the recording has nothing on the live sound - in person, with the amplification, it had so much more impact. Before Trevor Rabin's solo, they mentioned he had just become a US citizen, and a huge cheer went up. I also remember Rick's solo vividly, and was very impressed. But, being a kid, I started laughing when he riffed on something jaunty that made me think of Popeye, and the folks in front of us gave me a dirty look. Before "Your Move," Jon told us it was being recorded, so sing out. We did. I didn't know all of the songs that night, but my sister and I knew that one. Also the big songs - Roundabout, And You & I, Heart of the Sunrise, Long Distance Runaround, and the single at the time "Lift Me Up." Afterward, my mother said "Well, there were a lot of very good musicians on that stage tonight, and we're glad you got to see them." Yes music was around my whole life, but I didn't start listening to the albums on my own until that show. I didn't know "Awaken" at the time, but remembered it from the show when I got to Going For the One. It's great to know the first time I heard one of my favorite Yes song was at a show with the original guys playing it (and then some). I might have had a different take on this show if I had been older. As it was, this is the night that made me a Yes fan. 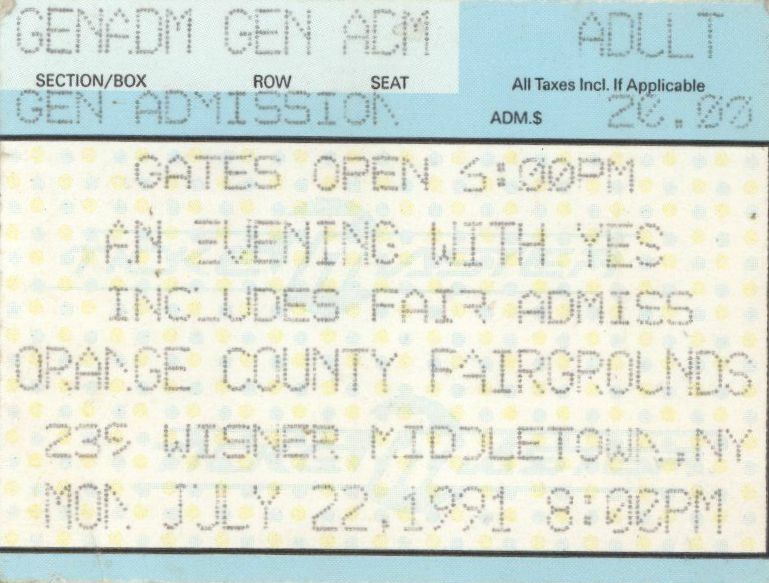 Being orginally from Middletown and living there at the time(I saw the ABWH and Talk shows here too)I was thrilled to see Yes again. The only thing I really remember them playing was "awaken" but I know they did some tracks from the Union album as well. I also remember that during at least one song they music was drifting back and forth really fast between the speakers in a very quadraphonic way(it must have been a quadraphonic sound system)so that was really cool. I also remember Chris getting these really low end bass tones on his five string that are probably the lowest tones I've ever heard and practically shook the whole place(it was an outdoor venue though but you could feel it in your chest. My only complaint is that Trevor Rabins guitar at times hit this really high pitched sound a couple of times that nearly made me deaf in my left ear(to this day I still have a bad left ear-tinutus to be exact)but other than that it was a great concert. I was only 8 rows back and this was a once in a lifetime opportunity to see these guys all on the same stage. The place was very much a full house that night too.Too bad I can't remember hardly any of what they played. Oh well. A great show of course - nice to have YES come to my home town again (after ABWH). The tension was pretty thick between Steve and Trevor I thought. The only bummer was at the end when one of the security guards saw me walking out with a camera in hand and pulled the film out of it.